This research guide provides a starting point for research in U.S. bankruptcy law. This research guide is intended as a starting point for research in U.S. bankruptcy law. The guide includes both primary and secondary sources, in both print and electronic formats. Since bankruptcy law in the United States is a specific responsibility of the Congress and the federal government, this guide concerns itself with federal law only, and does not address state debtor-creditor laws. Norton bankruptcy law and practice (3d ed.) by William L. Norton, Jr. This multi-volume treatise is organized in three parts - Part One is devoted to introductory and historical aspects of bankruptcy law and practice. Part Two analyzes particular sections of the Bankruptcy Code, largely organized by Bankruptcy Code section. Part Three discusses bankruptcy related subjects that may not correlate to a specific Bankruptcy Code section. Vols. 10 & 11 contain a comprehensive collection of bankruptcy pleading and practice forms. 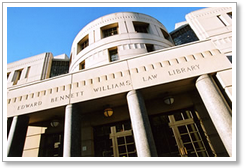 A complete legislative history of bankruptcy legislation is also included.